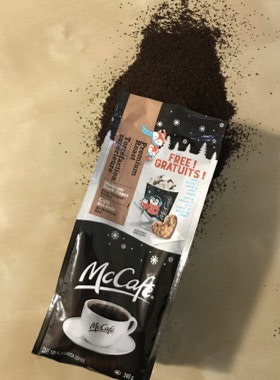 Elevated Enviro reviews McDonald's McCafe Coffee and how much of it can be diverted from landfills after use. Elevated Enviro reviews everyday products and what of them can be diverted from the landfill, waste diversion. We look at products through reduce, reuse and recycle. Recycling markets have changed and with that change has come confusion. We hope to clear up that confusion. Let’s see how McCafe does. The outside package is made of both foil and plastic. This makes the product un-recycable. The reason is that you would have to separate the plastic from the foil. Although, this is technically possible, the technology to do so is not deployed often and not in most markets. This makes the product very likely to head to the landfill. There is a metal twist tab covered in plastic on this product. Just like the above it is un-recycbale in most markets and will be landfilled. 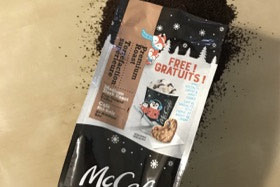 Inside the the package there is a small plastic tab that ventilates the coffee. We do not know the grade or quality of this tab and it is very small in size as such it will be landfilled. The coffee after use can be placed in a compost bin. We give this product a 1.2 out of 5.